Frances A. (Shenk) Kohlmaier, 94-years-old, passed away on Saturday, December 30th, 2017 at LGH while surrounded by loved ones. She resided at Woodcrest Villa. Before she moved there, she had lived in Willow Street, PA and attended The United Church of Christ. 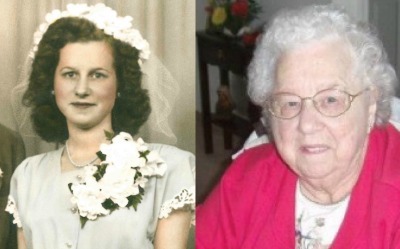 Frances was born on February 24th, 1923 in Lancaster, PA to the late Roy and Myrtle Shenk. She had 3 loving brothers, the late Charles, Robert, and Carl Shenk. A 1942 West Lampeter High School graduate, Frances was an energetic lady. She married her soul mate, George A. Kohlmaier and had 2 wonderful children they lovingly raised together. Son, G. Kenneth Kohlmaier, husband of Sue (Hemperly) and daughter, Kathy (Kohlmaier) Stoltzfus, wife of Rick Stoltzfus will dearly miss their mother. Frances was employed through RCA and was later a homemaker. Possessing a true servant’s heart, Frances cared for her mother for many years with help from her sister-in-law, Ellen Shenk. Known best for her ease in frequent conversations with friends and even new acquaintances, Frances loved volunteering at her place of residence as a greeter to new residents. Her sense of humor was pure entertainment, and she had a sweet, gentle, and caring heart that won the trust and affection of everyone that knew her. Her acceptance and love for others were only a few of the characteristics that made everyone comforted by her presence. wife of David “Brit” Lefever, Kim (Kohlmaier) Hoover, wife of Steve Hoover, Christine (Stoltzfus) Levering, wife of Jordan Levering, Kelly (Kohlmaier) Nauman, wife of Noah Nauman, and Keri Kohlmaier. Frances always considered herself blessed to be able to enjoy and spend time with her granddaughters, so it was no surprise the light and energy that radiated when she became a great grandmother. She is cherished by her 4 great grandchildren: Riley Lefever, Peyton Levering, Grant Hoover, and Ryder Dommel. She was eager and delighted to know she was going to have another great grandchild in May 2018. Frances also had abundant love for her nieces, nephews, and extended family. She will be remembered by all for her wondrous traits and characteristics, but most importantly her family will be comforted and smile when they think of all of her quirky quotes. There will be a Memorial Service held at Woodcrest Villa, Eagle Commons, 2001 Harrisburg Pike, Lancaster, PA 17601, on Sunday, January 21, 2018 at 2:00pm. For more information, please call: DeBord Snyder Funeral Home & Crematory,Inc. Lancaster, PA at (717) 394-4097. Or feel free to donate to a charity/organization that is close to your heart! The family is deeply grateful for the outpouring of love, prayers, and support. My sympathies for your loss. Your mother was always so nice to me when I stopped in to see you. Thank you Carol she was a wonderful mother who is dearly missed! I have such fond memories of your Mom: her sweet smile and kindness to us. I am grateful for the opportunity to have met her and am so sorry for your loss. Please know I am praying for you all. Thank you Anne for all your prayers and love for our family! She was a wonderful mother who is dearly missed! Ken and family………sorry to read about your mother’s passing i remember meeting her at your Christmas party. will remember her and your family in my prayers.